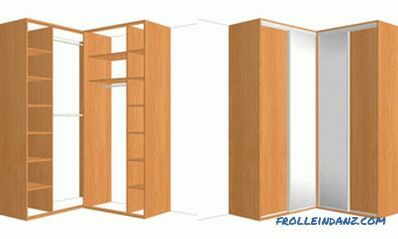 What craftsmen do not think up, creating something new from practically nothing. Here and the old window frames have found their application (not only in the form of firewood or a stock of glasses for replacement, as it was before), becoming the protecting structures for the greenhouse. 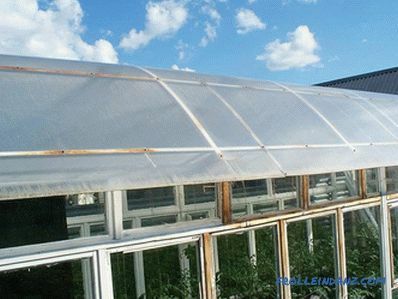 But they are really almost ideal for these purposes: durable, environmentally friendly, well-transmitted light, and even suitable for creating greenhouses of different sizes. 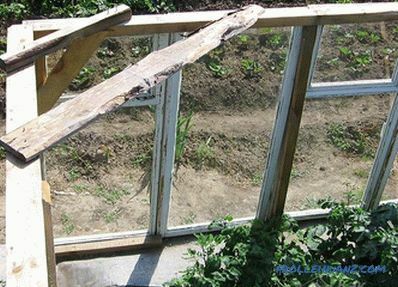 In addition, such a greenhouse does not have a problem of airing, since wooden window frames always have opening flaps. 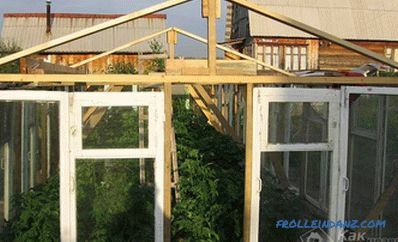 But how to make a greenhouse from window frames and at the same time not “reinvent the wheel”? 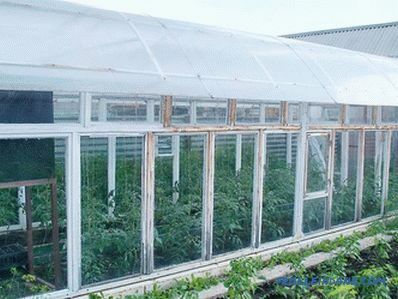 A greenhouse made of window frames is a rather heavy structure. Therefore, he needs a foundation. Dig through around the perimeter of its future greenhouse, a shallow trench (15 centimeters). Fill it with rubble and tamp it down (for this you can spill it with water and walk along it from above). Put two layers of waterproofing material (roofing material) on the tamped rubble. The ruberoid on the perimeter of the greenhouse is a bar, at least 10 by 10 centimeters in size (you can connect two boards horizontally, each 5 centimeters thick). 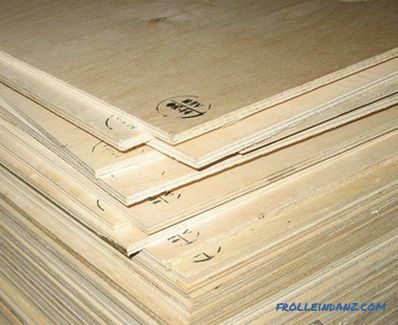 Timber is better to pre-process the bottom with bitumen mastic in order to increase its service life. Connect the corners with metal corners (from the inside) and plates (from the outside) at the corners. 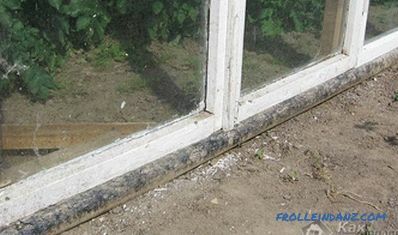 For a more solid greenhouse, you can pour a strip foundation (its depth is usually 25-30 centimeters), by reinforcing it with a volume frame from any fittings that are “at hand”. 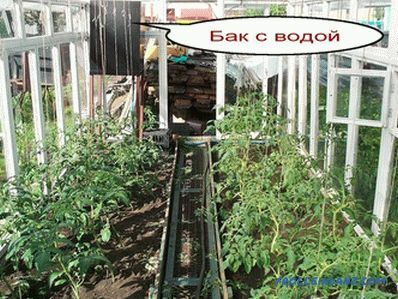 At the corners of the greenhouse, and also every three meters along the length of its sides, dig holes, at least 50 centimeters deep. Pour rubble (centimeters 10) at the bottom of the pits and firmly tamp it down. Above the pit, install a formwork with a height of one plank (if you are going to pour concrete columns), and then fill the pits with concrete, having previously placed a volume metal frame in them. 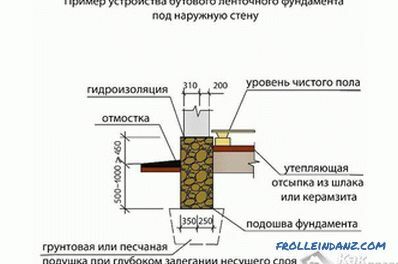 Poles can also be laid out of stones or bricks on a conventional cement-sand mortar. While doing the work, do not forget to check the horizontal position of the upper cut of the foundation and the unity of the level of all the pillars. 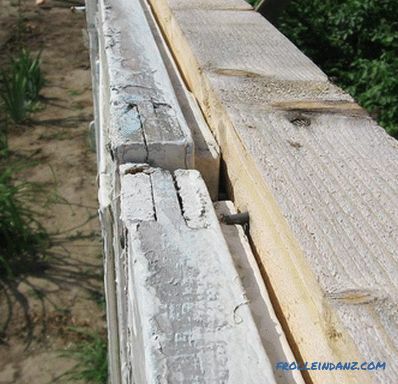 On top of the posts, lay a wooden bar, holding it in the corners with corners and metal plates. 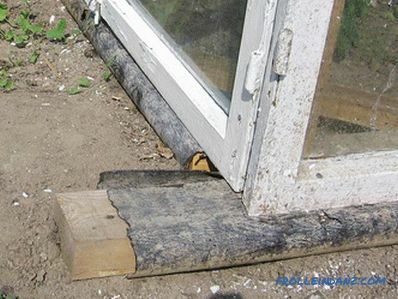 Do not forget to attach the timber to the foundation pillars so that the greenhouse is not blown away by the wind. 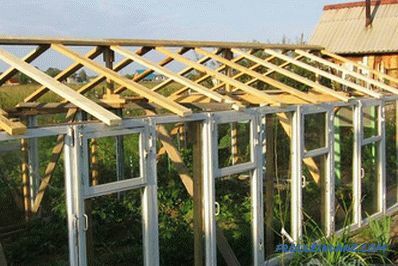 Start collecting the greenhouse follows with the construction of its frame. To do this, at its corners, as well as every 2.5-3 meters along the length of the sides (determine the size of your window frames), install vertical racks. Top of them combined into a single structure with the help of a beam (size, for example, 4x4 cm). 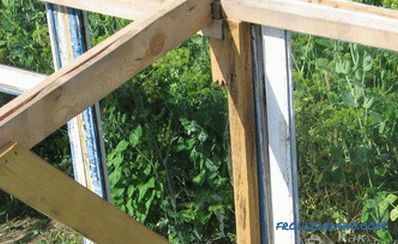 It is necessary to fasten the timber between each other with metal corners and screws, since it is necessary to make a greenhouse of window frames durable and tough. Then make the frame for the roof - that is, the truss system. 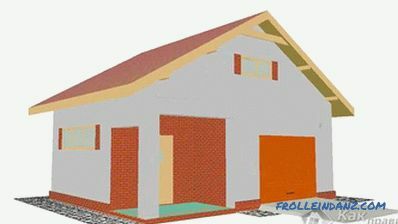 Do not forget to create a slope, as the window frames will be glazed and, therefore, can not withstand too much snow. After the frame is assembled, you can proceed to fixing the window frames. For the safety of work from them, you must first remove the glass (you will insert them later, when set the frame in their place). 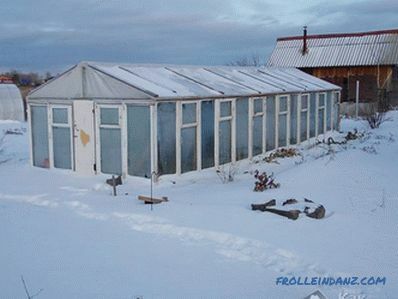 By the way, it is more convenient to collect such a greenhouse together, and not alone. 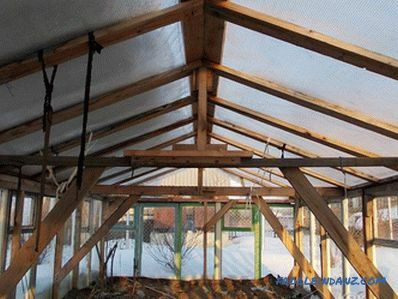 Roofing for a greenhouse whose walls assembled from window frames, there is no need to make of the same structures. If you have the opportunity to buy sheets of cellular polycarbonate, try to use it for these purposes. 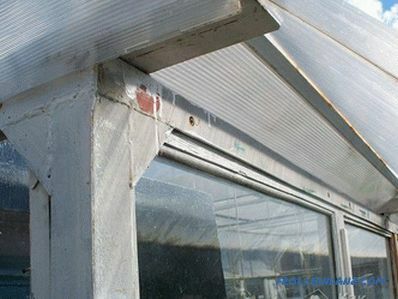 However, such a greenhouse will require a very durable framework, which is better to do from metal (shaped pipes with square or rectangular cross-section), and not from wood. 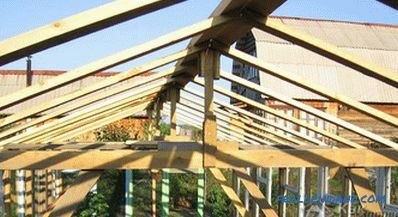 To simplify such a construction, profile pipes can be immediately used as the foundation base and as a greenhouse framework. 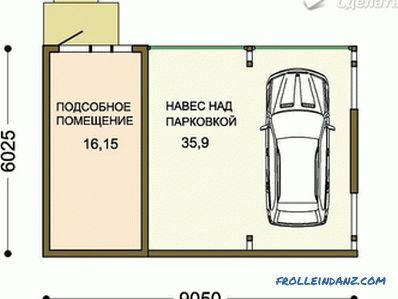 In order not to be mistaken in size, first make sure to make a drawing on a sheet of paper. Then cut the pipe to the desired length. Immerse the pipes with their lower end into the holes dug in advance (at the corners and with a pitch of approximately 3 meters along the sides) and concrete them there. Then weld from the same pipes the lower strapping (it can also be made from wooden beams) and the upper strapping, as well as the truss system. The semicircular shape of the polycarbonate roof is considered to be the most optimal, since there is practically no accumulation of snow on it. 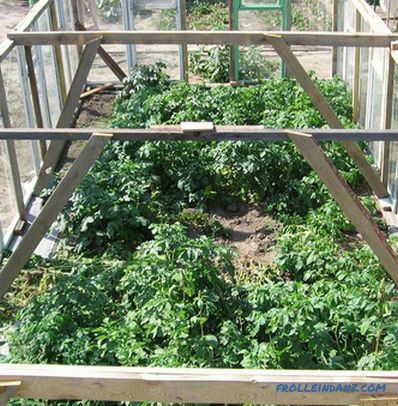 After the roof is fixed, all you have to do is to insert the window frames into the walls of the greenhouse and the board close the space between the ground and the lower strapping. The door to the greenhouse can also be made of polycarbonate, having previously made a wooden or metal frame for it. how to make landscape design with your own hands.